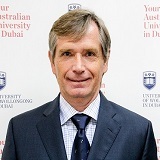 Dr Gomišček is an Associate Professor in the Faculty of Business at the University of Wollongong in Dubai. Prior to joining UOWD he was an Associate Professor and Head of the Laboratory for Quality Management at the University of Maribor, Slovenia. Dr Gomišček obtained a PhD in Atmospheric Chemistry from Vienna University of Technology, Austria. He also holds a BSc in Electrical Engineering from the University of Ljubljana, Slovenia. Prior to his role at the University of Maribor, he was an academic with the Austrian Academy of Sciences, Vienna University of Technology, and the University of Ljubljana. Dr Gomišček’s main research interests are in the areas of quality management; sustainability and environmental management; and maintenance management. Dr Gomišček is a registered member of the Slovenian Association for Quality and Excellence and the Slovenian Association for Maintenance.